Clover Diary, though simple, provides basic functions for keeping a diary - like calendar view, password protection, and others. It also has some functions that might encourage you make entries in your diary everyday. So, even if you've tried in the past to keep a diary and failed, Clover Diary can help. In addition, it can make html files, so you can add your diary page to your home page. 02.09 v2.9.0 Full adjustment to latest MacOSX. etc. This software is "Donation-ware". If you want to continue using it, please make small donation to help effort for the Japan earthquake and tsunami disaster. (For example American Red Cross) It doesn't imply any donation to me. Please note that the author takes no responsibility for any damage caused by the use of this software. 19.02.09 2.9.0 Full adjustment to latest MacOSX. Changed System requirement as MacOSX10.10 or later. 10.03.20 2.8.0 Improved HTML exporting function to export images in the diary. 09.12.05 2.7.1 Modified "Edit" menu items. Improved URL link function to set Japanese URL. 09.10.17 2.7.0 Improved exporting RTFD function. Added exporting specified range of diary with RTFD format. Fixed bug related to searching function. 09.09.12 2.6.1 Improved English UI. Added links for other colored version. 09.08.29 2.6.0 Improved Search function. 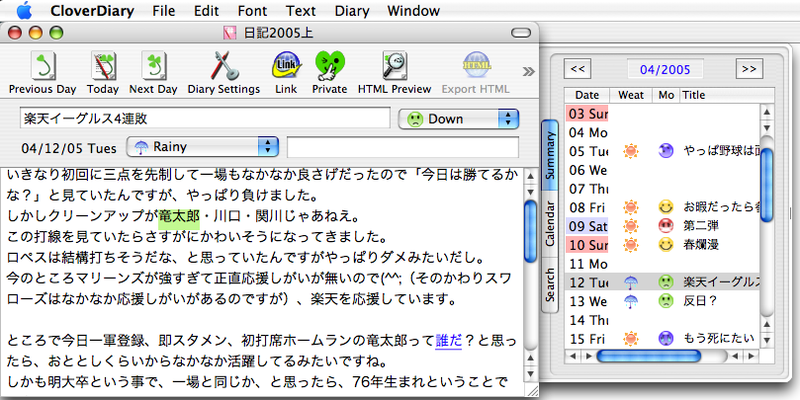 Modified to make Clover Diary show empty diary window when the application itself is launched. 08.09.20 2.5.0 Added "Auto save" function. 05.02.05 2.0.0 Rewrote everything for MacOSX10.3.